The origin of Zampone Modena PGI dates back to the beginning of the 15th century, and the celebrity of this product comes from numerous literary testimonies. According to some historians, in 1511 the inhabitants of Mirandola (in the province of Modena), began to stuff the meat first in the rind, then in the pig’s trotters, during the siege of the city by the troops of Pope Julius II. The Zampone Modena PGI is produced within the traditional territory of production according to the original and classic recipe. Zampone Modena PGI consists of a mixture of pork meat obtained from striated muscles, pork fat, rind, salt, and pepper. The minced raw materials pass into a kneader where they are mixed and flavored with salt and spices and then stuffed into the pig’s trotter. The last stage is drying in stoves, which can be followed by a cooking and sterilization treatment in vacuum packs that guarantee a longer shelf life of the product. The production regulation of Zampone Modena PGI provides that precise quality characteristics are respected as well as for the ingredients, also for the taste, the color and even the minimum protein and the maximum fat contained. It is served hot, generally with potatoes (boiled or pureed), spinach, or in the classic match with lentils. To enjoy it at best, should be cut into thick slices. It is one of the most traditional ingredients of the typical New Year’s Eve dinner, matched with lentils. This combination is considered a good omen for the new year and cannot fail on the tables of those celebrating this event. There is the legend of the birth of the zampone, in Mirandola di Modena, during a siege in the autograph letters of Gioacchino Rossini (1792-1868): “… I would like six priest’s hats (similar to those he sent me to Florence) four zamponi and four cotechini, all of the finest quality. In the following vignette, you can find the outline to avoid any misunderstandings “. 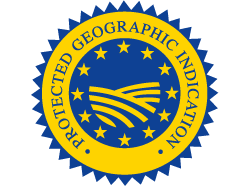 Protected Geographical Indication (PGI) recognized under Reg.ne EU Reg.to CE n.1107 of 01.07.1996 GUCE L. 168 of 02.07.1996.